It has come time to talk about a particular pair of boobies here at Kure Atoll. Before your minds drift too far, I’m talking about a pair of seabirds. With both our Brown Boobies and Masked Boobies starting their nesting seasons, it felt right to shed light on their intricate biology and place within the restoration efforts here on Green Island. With a great number of similarities between the two, both species are what we term ground nesters and take readily to open areas. When it comes to building a nest they differ in that Brown Boobies will build an elaborate nest of sticks and twigs as part of their courtship rituals while Masked Boobies are far more simplistic and simply clear out a scrap of bare ground. 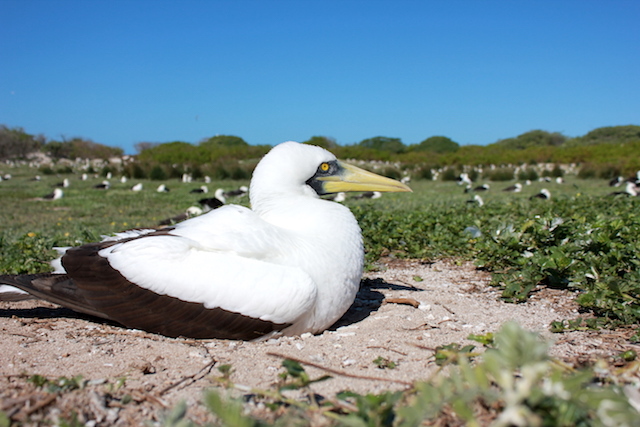 Though we have plenty of open space here on Green Island, the majority of nests so far are primarily located in an area aptly named Booby Acres Proper. Here, in a field of native nohu and alena, both species are finding space amongst the many albatrosses already set up and nesting in the area. Due to the need for open space to nest and take off into flight, Verbesina poses many of the same threats to them as it does to albatross when allowed to grow in large, dense patches. Since the removal of Verbesina stands that used to dominate the central plain region, both species have already shown an increase in nesting numbers here on the island. Masked Boobies, in particular, have gone from almost little presence to doubling in nest numbers over the past two years alone. It is another testament to the success of the work done here for even how small and yet unfinished it might be. As part of the Order Pelecaniformes, boobies forage via the art of plunge diving. Seabirds as a whole display a wide array of foraging behaviors, but few are as spectacular a sight as these birds diving. For anyone who has seen a pelican plunging off the coast, much the same, boobies in mid-flight and at up to a height of 100 feet will see something at the surface and immediately perform a quick twist of the body and hinge of the wings to swiftly propel themselves downward. Their true grace lies in their ability to fold their wings, forming an arrow-like figure and enter the water with darting smoothness high divers would be jealous of. The height and speed at which they perform this act explain their stocky build, aiding them to withstand the force of impact at entry. Another essence of their beauty-and a feared quality to some-is that in order to enter the water in such a manner and successfully grab a fish, it takes a strong bill and quick bite to catch prey before it swims away. I can personally attest to the strength these birds maintain in having a number of booby wounds from past encounters I display rather proudly. When working around a nest or checking it for whether it has an egg or not, a stick and distance are highly advised. They can reach farther than you’d expect and strike lightning quick with a heavily serrated bill so you can count on blood being shed if you aren’t careful. Thankfully, encounters are kept to a minimum but it never hurts to keep one’s distance. In terms of plumage and display, both male and female Masked Boobies look alike visually but are told apart vocally. A female gives off a booming honk while the male gives off a faint whistle. Much as the sounds go in tone, to me at least it seems the attitude follows as mom always is far more set on holding put and showing you who’s boss. When approaching a nest in monitoring studies, I always find myself saying “Please don’t be the mom” but often find my heart sinking when that honk comes along. As one of only two birds here that exhibit dimorphism, male and female Brown Boobies can be distinguished by the bill and leg colors; yellow for females, greener for males. For both species, there is a beauty to their eyes, crisply outlined by the feathers around them, and both exhibit wide-webbed feet that make them appear to waddle on land. These feet serve many purposes though none more important than incubating their eggs as they don’t possess a brood patch like other species of birds. Aside from the facts of flight and foraging, each species holds quite an odd trait in the manner in which they reproduce. What is referred to as obligate siblicide is when a breeding pair will often lay two eggs (small for the bird’s size) but will only ever raise a single chick (rare exceptions aside). The second egg acts as an insurance policy to the first. If one egg fails they have a chance at having the other hatch. Problem is what happens when both hatch? Few seabirds raise more than a single offspring each time they breed as the cost to forage and feed them is usually pretty high. Thankfully for the parents, they don’t have much say in the matter because one chick solves the dilemma before they have to. Usually, the first to hatch and, thus, the larger chick is usually the one to out-compete the other for food. And while still naked and incapable of greater body control, will kick the other chick out of the nest, where it will rest until its timely death. Parents won’t bring it back or pay any heed to its existence. As sad as it is, better young and one than splitting resources and both potentially ending up dying. In short, these are two remarkable birds. Given my experiences, it might be clear why I always get a little excited with all the “Save the boobies!” campaign. At first thought, I think it’s about protecting these very seabirds I talk about. Maybe someday that will actually be true, not that I’m against the other form of awareness though either. But until then, as more continue to pair off and nest here, I’ll stand knowing I’m doing my part to reach my idea of that goal, as odd as it is.